With each post in this mini-feature, I highlight a game from a different country around the world. Keep in mind these aren't necessarily the best or most popular games from each nation, but simply a fitting representative. While massively-multiplayer online giants like World of Warcraft continue to lose steam, Eve Online is the little engine that could. 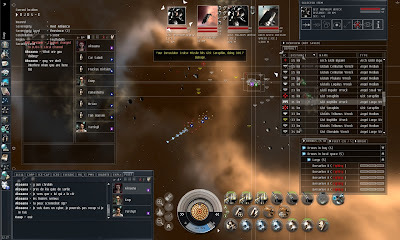 The science-fiction spacefaring title by Reykjavík studio CCP games has a fertile player base, nearly a decade after its release. MMOs face the colossal task of keeping their subscribers interested in their game after playing for a month or so. World of Warcraft, and others like Guild Wars and The Old Republic, try to do this by continually creating more content in the gameworld, releasing expansions fairly regularly. CCP Games updates their game with tweaks and patches, but Eve Online's ecosystem thrives because of its reliance on emergent gameplay. Instead of play being dictated by the developers, it's dictated by the players--this is the perfect fit for a massively multiplayer title.Eve features perhaps the most highly-developed in-game economy of any MMO ever published, which contributes to the game's longevity. It's not the most accessible game for casual players, but for those who sink their teeth into it, Eve boasts a vibrant player community that's nine years old. But CCP isn't done. They're currently working on Dust 514, a first-person shooter which ties in to gameplay in Eve Online. While Eve players control world events on the macro level, Dust 514 players execute events on the micro level. This merging of strategy games with first-person shooter games has been attempted numerous times over the years, but CCP is trying to finally get the concept right when Dust releases at the end of the year. On the skyrocketing number of "special editions"
On the advent of "slow games"